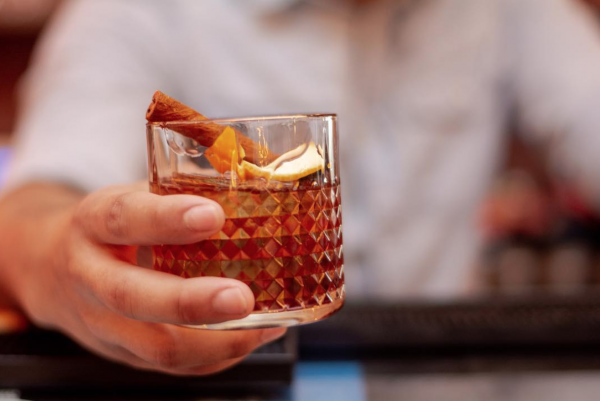 The Sugar Daddy aka The Dominican Old Fashioned replaces bourbon with Mamajuana spiced rum. Mamajuana is a specialty rum from the Dominican Republic, which is infused with a uniquely aromatic spice blend. In this recipe we use Candela, which is a premium Mamajuana rum. This cocktail has become popular thanks to the special spicy notes the Mamajuana rum adds to the recipe. It's one of those cocktails that never get old. Add the rum, sugar and bitters into a mixing glass. Add ice. Stir for a few seconds until the sugar is dissolved. Fill a whiskey glass with large ice cubes, then strain-pour the cocktail. Rub the orange peel along the rim of the glass, then drop the peel inside the glass. Founder of Candela Mamajuana, the sexiest rum in the market.